Hello everyone! I hope you had a wonderful Memorial Day weekend! 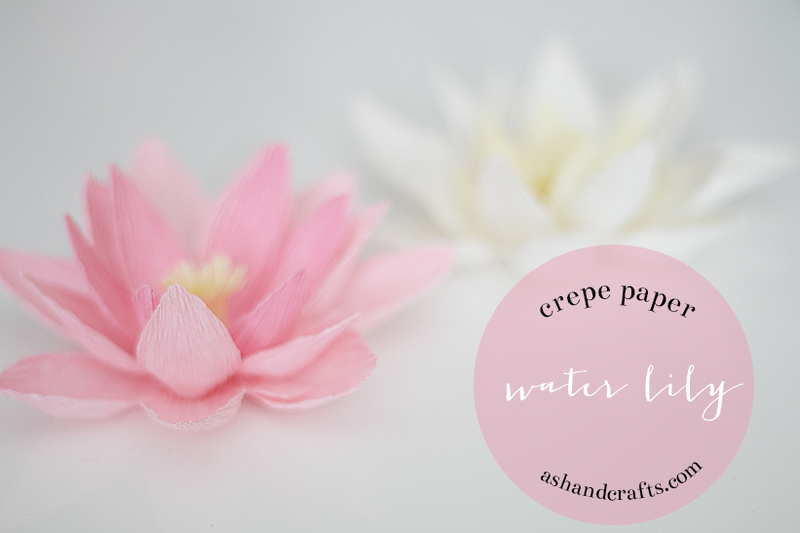 Today I have another crepe paper flower tutorial for you. When I posted my succulent tutorial, I mentioned that I had to find a way to make the petals look thick or else the succulents would look like a water lily. Someone asked me if I had a water lily tutorial, so I decided to go ahead and make one. The technique is similar to the succulent tutorial: shape petal and glue onto a circle base in layers. This tutorial will be very easy. 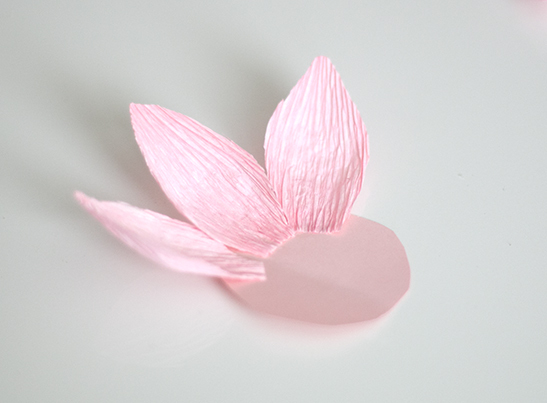 Crepe Paper – For the flower in the tutorial, I used two very similar shades of pink for the petals and a light yellow for the center. 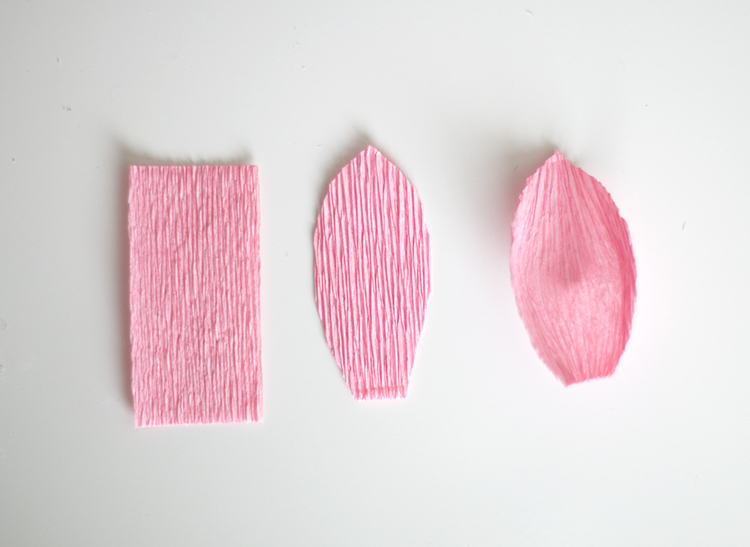 First, you need to cut the crepe paper into strips. My strips were approximately .5″x2″. Make sure that the crinkles run parallel with the length of the strip. You will need about 20 strips. I had three layers for my flower: The outermost layer had 7 petals, the middle layer had 6 petals and the inner layer had 6 petals. Your flower may have a different petal count if the shape is different from mine, which is fine. 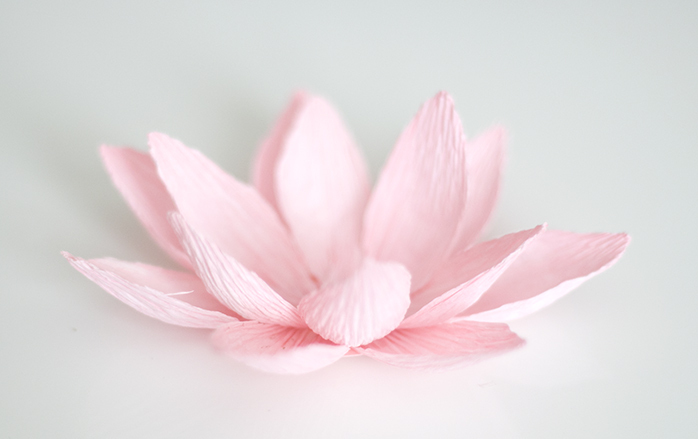 As you move up in layers, cut the petals narrower than previous later, so that the widest petals are on the outside and the narrowest petals are inside by the center. 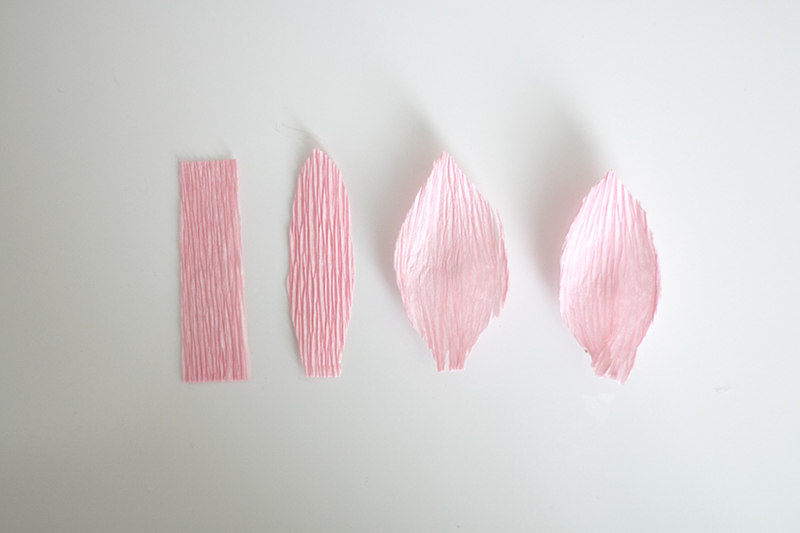 Using the pad of your thumbs, stretch the crepe paper at the base of the petal, before it starts to taper. Your petal should form a cup or bowl shape, like the 3rd petal in the above image. The 4th petal in the image above will be explained in the next image. 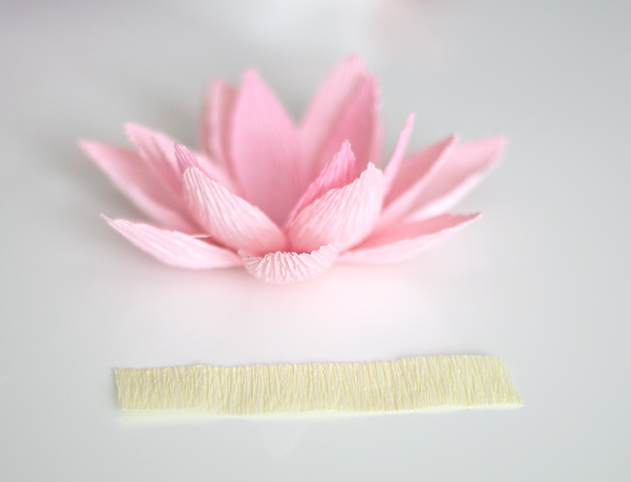 You don’t need to do this step for the petals in your first layer. 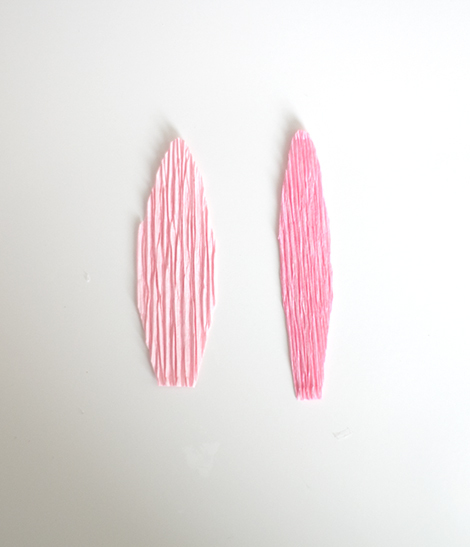 This image shows you the difference in width for my outermost petals (left) and the innermost petals (right). Cut a small slit at the base of the petal, where the black dotted line is drawn in the image above. This creates two little flaps, colored red and blue. Glue one flap over the other using a tiny bit of glue. In the image above, I tried to illustrate that the blue flap is now overlapping the red flap. This creates a curve at the base of the petal so it stands up a bit more instead of being flat. 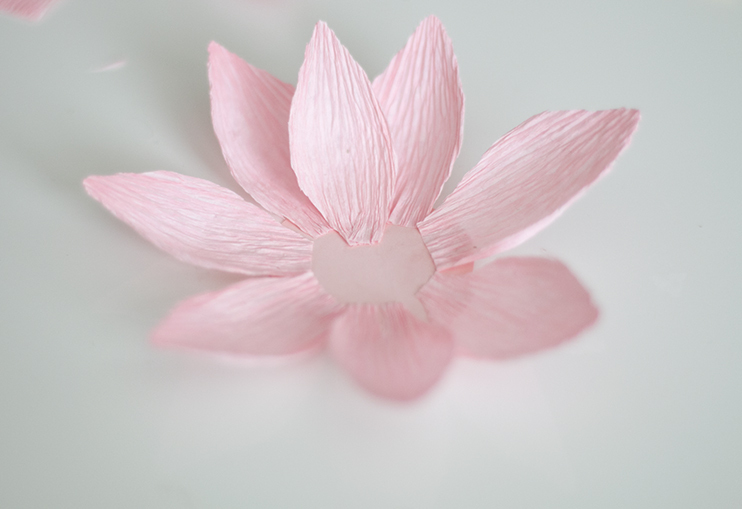 As you make your layers, the inner petals will need to stand up straighter than the outer petals. The more you overlap the flaps, the straighter the petal will stand. 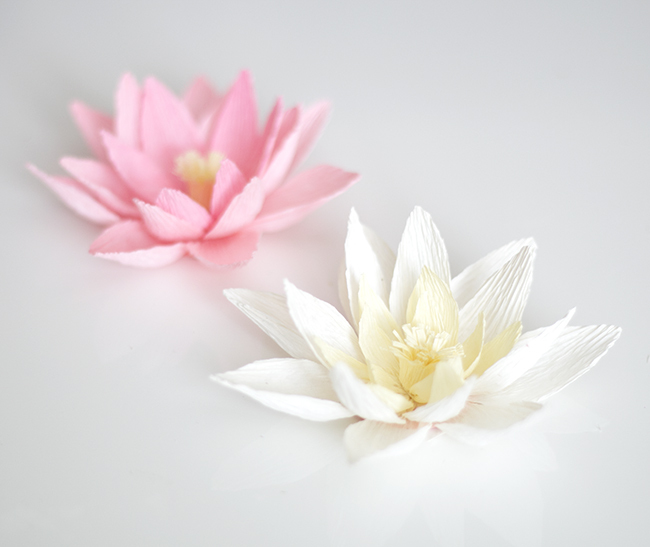 Therefore, you do not need to do this step for the outermost petals, because you want the petals to lay flat. But as the layers move inwards, the petals should stand up straighter. 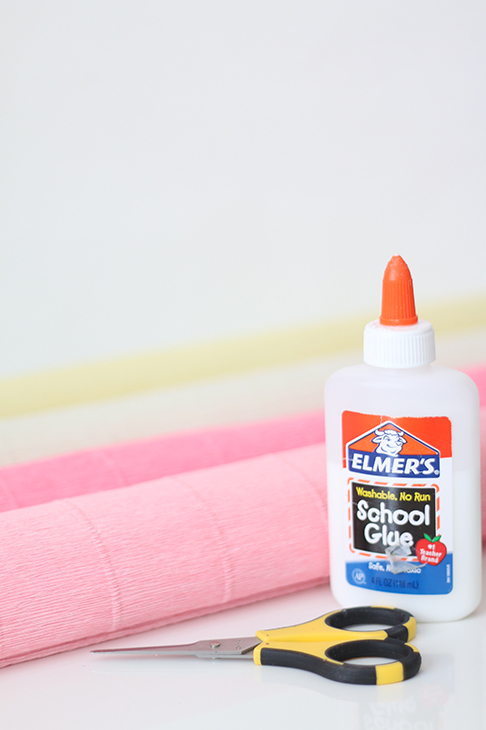 Begin gluing your outermost layer onto the circle base. This is what it should look like once you’ve completed your first layer. Begin adding your second layer of petals. If you look carefully, you can see that the petal in the second layer has a slitted base and one flap glued overlapping the other. Again, this is to make the petal stand up straighter than the petals in the outermost (1st) layer. This should be what your flower looks like now with two layers. I added one more layer in a slightly darker pink. You can add as many layers as you like. In this image, you can see my 3rd layer is in a slightly darker pink crepe paper. 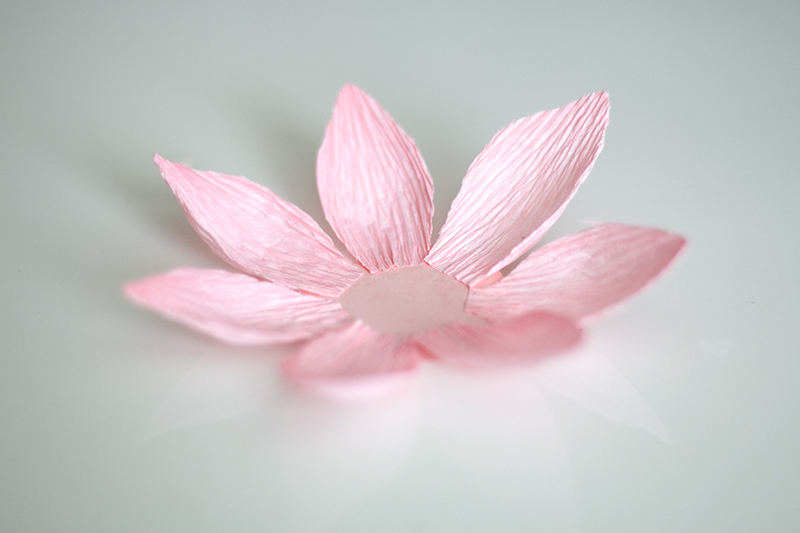 To make the center for the flower, you will need a strip of paper, approximately 3″ wide and .5″ tall. This time, make sure that the crinkles of the crepe paper run parallel with the short length. 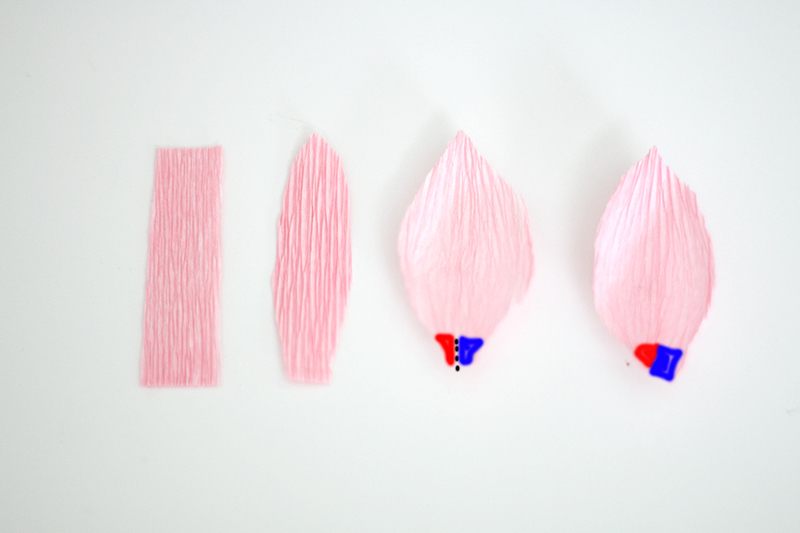 Carefully create a fringe with the strip of paper by making cuts 3/4 of the way through. Using your fingers, slightly curl the fringe away from yourself. 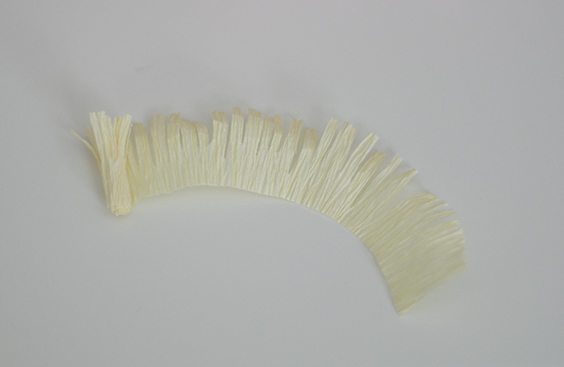 Then begin rolling the strip of paper up, so that the fringe is on top. Add a little bit of glue to the intact bottom as you go. 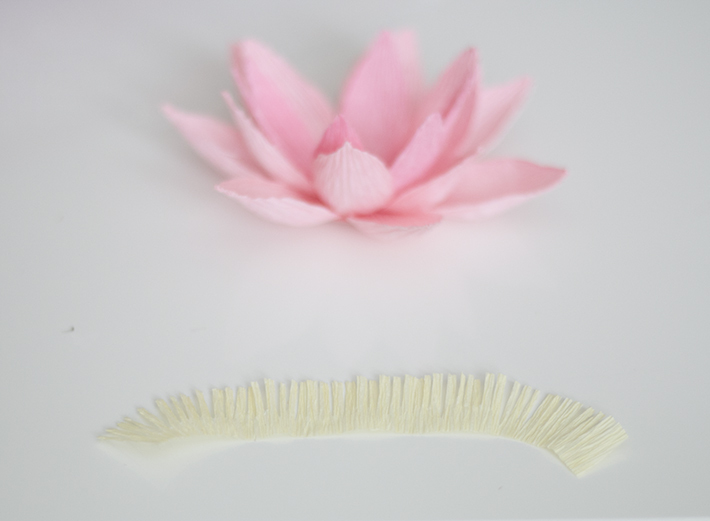 Spread the fringes apart to create a fuller center, and then glue it to your flower. And your water lily is complete! Here, I made a variation using two layers of white petals, one layer of yellow petals, and a yellow center. BONUS: Using the same method, you can create a lotus as well. 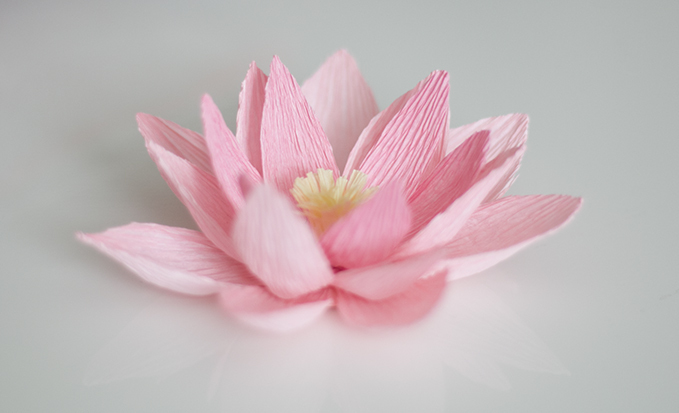 You need to cut the petals so that they are wider and shorter than the water lily petals. 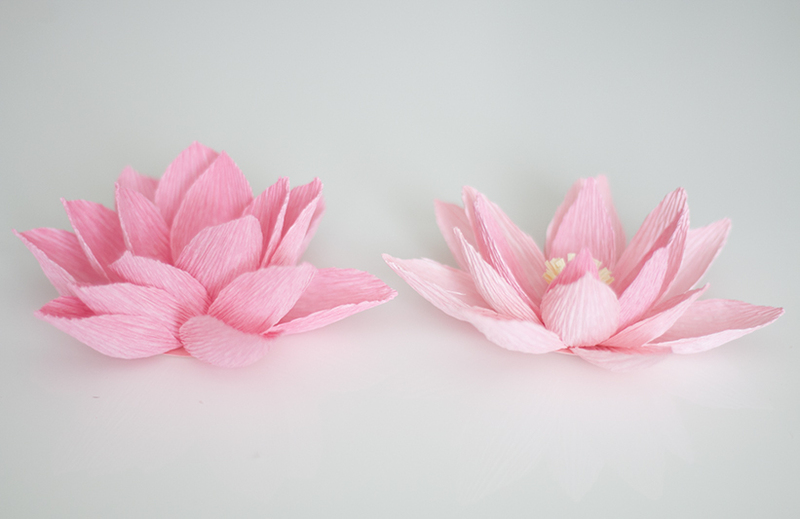 Here is a side-by-side comparison of the lotus (left) and the water lily (right). I hope you’ve enjoyed today’s tutorial. If you like making crepe paper flowers, please see my other tutorials, such as a crepe paper flower peony, calla lily, and succulents. If you have any questions, please feel free to leave me a comment or contact me through my contact form. If you have any suggestions for tutorials, I’d love to hear them! Ash, these are too cute! I absolutely love them. Thanks for another beautiful flower tutorial!!! My pleasure, Willow! Thanks so much for stopping by and commenting! Oh they are gorgeous! 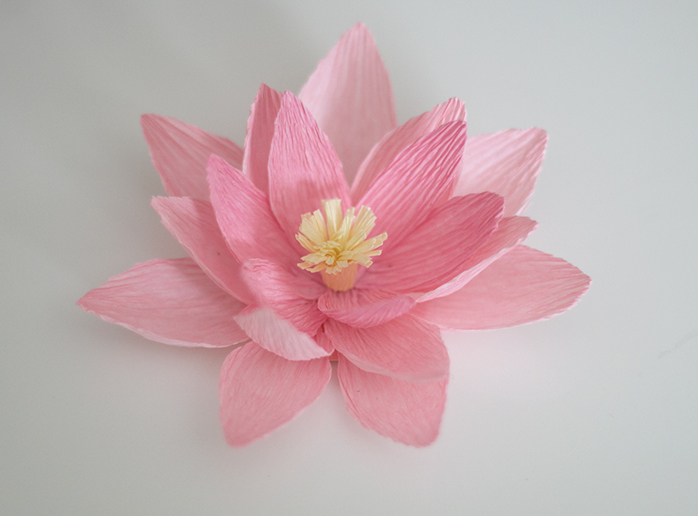 I keep pinning paper flower tutorials, I think I’d better start actually making some. They are just so darn pretty! Thanks so much, Julie! They’re very easy! Found your cute tut via Pinterest and had to check it out!! Oh my- how pretty!! Can’t wait to try! Thanks for sharing! I love your paper flower backdrop tutorial. You do an excellent job with your explanation and example. Hello!! I love your tutorials. Where did you get your crepe paper from? I’ve been looking everywhere…. I love this flowers – and your tutorial is so well done. Thank you so much! Please tell me what size the petals for the lotus should be. These are beautiful, I cant wait to surprise my mom! What weight of crepe paper do you use?